Hidden Merle and Cryptic Merle Hidden merle are Merle dogs (mM), who do not exhibit the merle pattern (it is usually not detectable to eye in red, gold, fawn or cream colours). This is DANGEROUS because this is how we get the lethal merle to merle breeding! 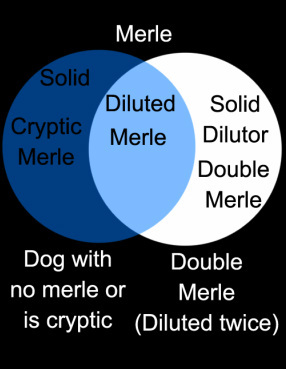 Cryptic (phantom) merles are individuals that have only very slight merle coloration and therefore they are often considered non-merle. The lack of visible merle colour could be because it is much reduced in amount so that it is inconspicuous or it can be concealed by white markings. It is really necessary to examine properly all puppies looking as „non-merle" at first sight, whether there is somewhere a less visible patch of merle. If such patch is found, it is not a non-merle, but a blue/red merle called cryptic / hidden merle. Particularly in long-hair coats a small patches of merle can disappear and such individual will be in its pedigree kept as non-merle. Later on, it can be mated with other cryptic / hidden merle individual. The breeder will be surprised by merle puppies that may have various health defects due to unsuitable mating of parents. Health complications related to merle allele Both heterozygous merle (Mm) and homozygous merle (MM) may exhibit eye and ear abnormalities incl. mild to severe deafness, increased intraocular pressure, ametropia (bad refraction ability) and colobomas. Individuals of MM-genotype may also be associated with abnormalities of skeletal, cardiac and reproductive systems. These dogs often have heterochromia iridis (difference in iris coloration); the individuals often have blue eyes or only one blue eye. Dogs with merle colour have visibly less pigmented eye ground, which may affect their eyesight. The ear abnormalities are also caused by absence of pigment in hairs of auditory passage. The sound waves (longitudinal oscillation of air molecules) cannot propagate into the middle and internal ear, which results in partial or complete deafness. Homozygous merle dogs (MM) are very pale, sometimes white and the colour of their mucous membranes is also lighter to pinkish and the eye pigmentation is mostly blue.